The Aging with Pride Committee originated at Spectrum (http://ourspectrum.com), K-W’s first LGBTQ+/Rainbow community space. We’re a committee made up of LGBTQ+ identified seniors, allies and service providers dedicated to the following: identify and resolve systematic barriers that LGBT+ aging populations face, ›increase opportunities for social interaction, increase understanding and sensitivity among hospital staff, care facilities, and support services. We meet once a month at Spectrum and provide workshops & educational opportunities in the Wellington & Waterloo regions. 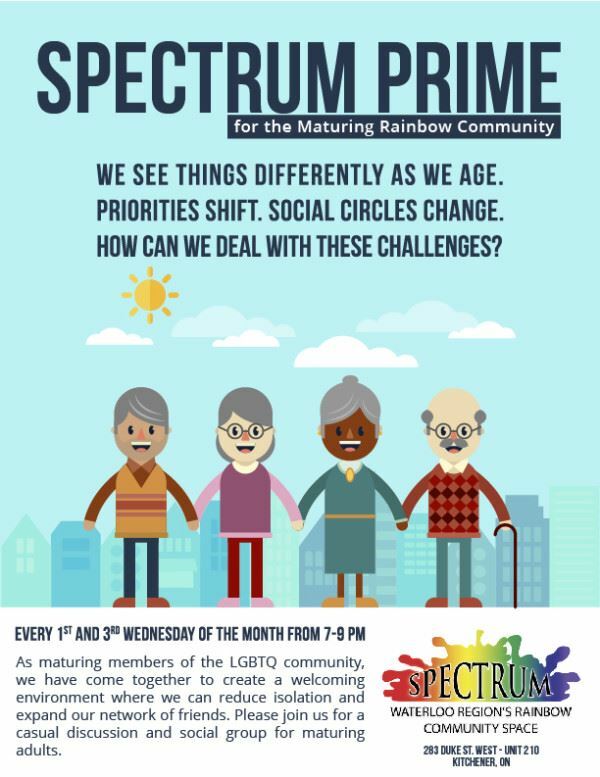 SPECTRUM Prime is a social and discussion group for older LGBTQ-identified adults. Our Goal is to reduce isolation among older adults in the local LGBTQ community, and to create a supportive community for ourselves as we age. Our Activities- Twice a month we gather at SPECTRUM for socializing and discussion. We also go on social outings. In the future we plan to invite speakerson topics of interest to us, and also arrange inter-generational gatherings where we might tell younger folks our stories and hear theirs as well.